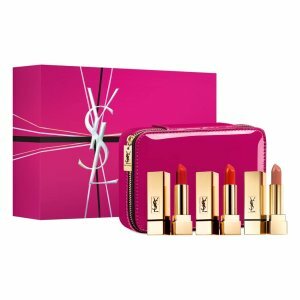 Nordstrom offers the YSL Rouge Pur Couture Lip Color Trio for $78. Receive 26-pc gifts ($123 value) with any $125 beauty and fragrances purchase. Plus, receive Lancome Advanced Génifique Serum (0.27 oz. ), Bi-Facil Double-Action Eye Makeup Remover (1.7 oz. ), Absolue Premium ßx Absolute Replenishing Cream SPF 15 (0.5 oz. ), and Rénergie Lift Multi-Action Lifting and Firming Eye Cream (0.2 oz.) ($117 value) with any $175 beauty and fragrances purchase. Choose a pink pouch filled with samples via coupon code PINK . Choose a yellow pouch filled with samples via coupon code YELLOW . OR, receive a CHANEL Rouge Coco Flash lipstick sample palette via coupon code CHANEL . Plus, enjoy 3 samples at check out.